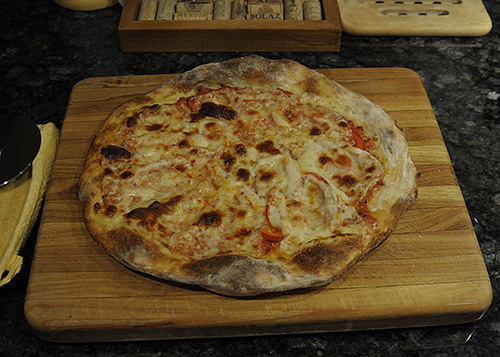 Evolved and adapted from Vincenzo Buonassisi's PIZZA Plus, William Collins & Sons Ltd. 1985, watching cooks in restaurants in Italy, and from Tony Gemignani Neapolitan Pizza video on YouTube. The point of this evolution is that it is easy, real, a quick but incredible supper, and you can live on this stuff and stay skinny. It looks long at first but goes pretty fast after a few times. Your mixer does the work, but it takes about 3 1/2 hours from start to using the dough. The recipe makes 4 to 6 balls of dough and I usually only use 1 ball and freeze the rest in individual sandwich bags. For large pizzas divide into 4 balls, for individual pizzas, divide into 5 or 6. To defrost, put the frozen dough into a bowl covered with plastic wrap and leave out at room temperature for 4 or 5 hours. Then put in refrigerator and use after it has cooled a bit, or in the next day or two. I eat this for lunch once or twice a week and it takes about 20 minutes from start to table. Slight adjustments in flour and water may need to be made depending on flour type and where you live. Experiment. Crushed peeled San Marzano tomatoes. Or, I use a can of Muir Glen Organic Fire Roasted Diced Tomatoes. Puree using a Cuisinart Smart-Stick type mixer or blender. This will store for a long time in the fridge and only about 2 tablespoons are used per pizza. If too wet, sieve off a bit of the liquid. Whole milk mozzarella (the fat slows down the carbs - so avoid skim/processed crap). Use a brick of cheese, not grated! Dissolve the yeast in 3 oz of warm water and allow it to stand for a few minutes. In the mixer bowl, add the cup of King Arthur Bread flour and then the water/yeast and mix until a shaggy dough is made. Mix with a wood spoon and then ball up with hands as it’s quicker than using the electric mixer. Cover the mixer bowl with a plate (or plastic) and allow it to remain at room temperature (or slightly warm place) for 1 hour. After the starter has fermented for an hour, add salt and 3 cups of flour to the bowl. Turn the started dough with the wood spoon and mix it a bit with the flour. Add the 10 oz of water. Knead by hand (for a long time) or use 1 speed of KitchenAid mixer with the dough hook until mixed and then speed 2 for about 5 to 6 minutes. The longer the kneading, the more soft, smooth, and elastic the dough. After kneading, cover the mixing bowl with a plate and let rise at room temperature (or slightly warm place) for 1 1/2 hours or so. Scrape out the dough onto a floured work surface (a yogurt container lid cut in half works well as a scraper) and gently form into a long log. Divide the dough into 4 to 6 equal portions. Put what you’re going to freeze into sandwich bags squeezing out the air and put in freezer. For dough to be used, place into a large cereal sized bowl and cover with plastic wrap. Place in refrigerator for at least an hour before use. The dough will puff up a bit. It can remain in the fridge for a day or two before use. Bring it out of the fridge a few minutes before use to warm just slightly. A trick to pushing out an even thin pizza is to have the dough cold - that’s what they do in the restaurants. The best way to learn this is to watch the Tony Gemignani Neapolitan Pizza video on YouTube (see video below). Scrape the dough out of the bowl and onto a well floured work surface. Pat both side of the dough ball on the flour. Gently flatten a bit and then using your finger tips, repeatedly pressing down into the dough to flatten more, avoiding the very edges so a small lip is formed. The dough is now about 6 to 8 inches in diameter. Then, as in the video, use your hands to work/spin the dough into a thin pizza of about 1/8th inch thick and about 12 inches in diameter (for a single pizza). Enough flour underneath will help when pushing out. If the dough is cold, it’ll be more elastic and easier to push out evenly. It does take some practice, but becomes easy when you get it. For a Roma Pizza, take a roller and after pushing out with hands, quickly roll across the dough mainly to flatten the edges. The edges will then puff up when cooking. I use a round steel pizza pan coated with a very slight amount of olive oil. The steel pan is easier than a stone or other tricks and does a decent job. To find better, you’ll just have to go to Italy. The trick is to keep the toppings cold, including the cheese so that it takes longer to cook and the crust gets crispier. Place the flattened dough on the steel pan. The shape is not as important as an even thickness. Top the dough with 1 to 2 tablespoons of tomato sauce and spread around with a spoon. Place whatever toppings you like (research different Neapolitan standards). The photo above is just thin sliced fresh sweet bell pepper, a little feta, and mozzarella. Use about 4 oz of mozzarella (1/4 of typical 16 oz package) and pinch off large chunks that you place on the pizza. Finish with a thin circular drizzle of olive oil and slide into the oven. The oven should be as hot as possible with rack towards the top, especially is using convection setting. My oven goes to 525 degrees on convection and it takes about 6 minutes to cook, longer if there are more dense cold toppings. Neapolitan pizzas in Italy cook at 800 degrees. For many toppings, it is best to cook them ahead of time with spices to get the most flavor. Cool them in the fridge before using and keep extras for a quick meal during the week. One of my favorites is with mushrooms cooked with cayenne pepper, olive oil, and a little red wine. Topped along with the mushrooms I add black nicoise olives. A pizza made with sweet Vidalia onions pre-cooked until slightly caramelized is my wife’s favorite. And, the recent fresh sweet green pepper pizza was really good. I had a potato pizza at an amazing restaurant in Trastevere called Bir & Fud (they serve Roma pizzas). The potatoes were sliced thin and pre-cooked in olive oil and salt to slightly browned, but still soft. This is another favorite and I add feta along with the mozzarella. Hope your friends enjoy this Tatiana!